Mkulumadzi Lodge is owned and run by Robin Pope Safaris and you will enjoy great wildlife viewing vehicle by vehicle, boat and on foot. The lodge nestles amongst giant leadwood trees and wild mangos. There are just 8 chalets ensuring privacy and the lodge has superb amenities including a viewing deck, restaurant, separate bar and swimming pool. The chalets are spacious and luxurious, with a large bedroom, lounge and en-suite bathroom with twin basins and sunken bath. There is also an outdoor rain shower. All chalets have a private viewing deck from which guests can watch the wildlife in and around the Shire River. There are 2 family chalets, each with 2 bedrooms and bathrooms. There is also a honeymoon chalet. The roofs of the chalets are formed using local vegetation, which minimises their impact on the environment and helps keep the rooms cool in the heat of the day. 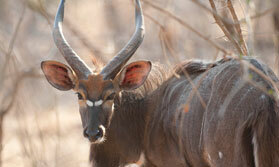 Game drives and walking safaris are offered in the morning and late afternoon. Full day game drives with picnic lunches can also be arranged. The Majete Wildlife Reserve is home to abundant wildlife including elephant, black rhino, buffalo, hippo, sable and impala. The birdlife is profuse. Boat safaris on the Shire River offer a different perspective and can be taken as an alternative to game drives. It is also possible to visit the impressive Kapichira Falls which are just a few kilometres from the lodge or to hike up Majete hill. When not game viewing you can relax by the pool, on your own deck as you watch birds, or view animals at the waterhole from the hide. The lodge can organise visits to the local village and community centre to give a glimpse into the lives of the local people. Meals are served in the restaurant or on the terrace in the open air. As well as breakfast, lunch and dinner, guests can enjoy afternoon tea. Dinner is often taken al fresco and romantic dinners can be arranged on your own private deck. Open: Mkulumadzi Lodge is open all year. Location: Mkulumadzi Lodge is in a 7,000 hectare private concession in Majete Wildlidfe Reserve. It is on the banks of the Shire River, near the Kapichira Falls. Rooms: There are 8 wonderfully spacious and light chalets. They have bedrooms with sitting areas and large verandas with views of the river. The en-suite bathrooms have twin basins, sunken bath and flush toilet. There is a separate shower, open to the sky. The mosquito net over the bed has a built-in air conditioning system. There are sockets for charging cameras and phones. There are 5 double or twin chalets, a honeymoon chalet and 2 family chalets. Activities: These include morning, afternoon and full day game drives, early morning walking safaris along the river, hikes up Majete hill and boating safaris. There are viewing hides for close up views of wildlife. Visits to a local village and community centre can be arranged. Facilities: There is a large lounge with a high thatched ceiling and an outdoor terrace. There are indoor and outdoor dining areas and a camp fire. The lodge has a bar. You can buy gifts and souvenirs from the shop. There is a plunge pool and sundeck. The lodge provides a laundry service. The lodge runs off solar power with a backup generator. Communication: There is internet access for emergency use. "One of the most stunning lodge locations we have experienced. The staff are warm, friendly and well trained and provide a wonderful atmosphere. The food is good, plentiful and well presented "